Duncan Grame came running into the small Inverness pub overlooking the Loch, panting. “The Monster!” he gasped. “I saw the Monster!” None of the locals even looked up from their drinks, knowing all too well that Duncan did that once a week. He was a lowlander, things like this were pretty much expected of him, in their opinion. However, they did not consider that something was different this time, not about Duncan but about their pub. There was a stranger there, sitting well-dressed and alone at a table in a corner. That stranger took careful note of what Duncan said, and when he returned to his Bed & Breakfast he asked to use the telephone and called his editor. He had been sent to Inverness to report on a boring cultural event. Monster-sightings were so much better than that. And the next morning, the photographers descended on Loch Ness like a swarm of hungry locusts. But this time, things truly are different around the world-famous Loch Ness. Meepsie – that’s the Meeple Monster of Loch Ness, if there’s any doubt – has been sighted and she’s feeling particularly photogenic: in Loch Ness, she does what she can to have her photo in the papers, all it takes is a clever photographer to be in the right place at the right time. 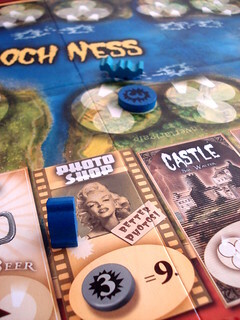 Loch Ness is not a deduction game, but lets see if you can figure what is your role in the game. Everyone who thought “take photos of Meepsie” is allowed one meeple-shaped cookie from the cookie jar. Obtainig photos of Meepsie is actually much easier than decades of grainy, blurry photos showing something that might be a shadow or not would make you think. Around Loch Ness, there are only fifteen spots where Meepsie might surface, and each of them is easily accessible and has space on the coast for two regular cameras plus a special camera. Looking at it like that, I think the game might give a wrong impression of the difficulty of taking a Meepsie snapshot. And there’s also the little detail that you control Meepsie’s movement that gives the fictional photographers an edge over the real ones. Meepsie’s speed is set at the start of each round. The first three players choose one of their cards and play it face down. Each card has a value from one to five and their sum is the number of spots Meepsie will move. In the regular game, all cards go back to your hand after the round, so in any given round Meepsie can move anywhere from three to fifteen spaces. We all preferred the variant where cards stay discarded until you used them all or take them back with a special action, just to make the game a bit less random. Especially for players four and five, who don’t know anything about Meepsie’s movement because they didn’t contribute cards, the variant makes the game more predictable. That plus the changing start player almost eliminates the disadvante of not playing a card. But before Meepsie starts swimming, she gives everyone time to bring their cameras in position. Remember, this monster loves the camera, she doesn’t want to sprint ahead. Players take turns placing or, on later turns, moving their cameras to the location where they think Meepsie will appear. Each player has four cameras with values three, four, five and seven, but five is your grandfather’s first camera, a real antique, so you only use it on special occasions (in one variant). The cameras give you their value in victory points when they take a picture. The three players that got to play Meepsie cards obviously have a great opportunity to bluff here: put your first camera just one spot ahead although you know for sure that Speedboat Meepsie will move five spaces with your card alone and watch the others follow you and fall short. You just have to figure out how to bluff and still score points yourself. When all cameras are placed the movement cards are revealed and Meepsie moves. 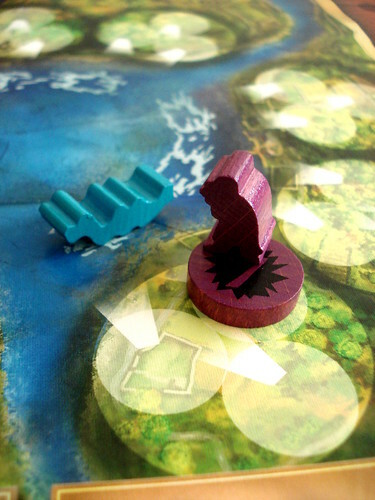 When she comes to a halt and waves at the camera, points are awarded: you get the points for every camera in the right area – an area has two or three spots to take photos from, and for every camera in exactly the right place you also draw a photo card that is worth more points when the game ends. In round two and beyond, Loch Ness becomes more interesting by adding locations with special actions, one of which you may pick before the round, as long as no other player picked that one before. Going to the bagpipe shop, for example, gives you the chance to move Meepsie by one more space after her regular move. Your playing seems to be pretty horrible, maybe you should practice more. In the Pub you can hire a local with a five-point-camera to cover an additional spot for you. The Photoshop makes your three-point-camera count nine points instead – while I’m writing this, I realize that maybe they mean the software Photoshop, that would explain a lot. Going to the Castle you may move all three cameras instead of the usual two. The Distillery lets you use the neutral card deck that includes a zero and a seven on top of the usual cards and is especially useful when your hand is depleted but you want to keep people guessing. On the other hand, it’s utterly useless when it’s not your round to play a card. In those rounds, the Church is a very good bet. In a divine vision, you may look at one of the three movement cards for this round. Finally, and only available in our usual variant, the Hotel allows you to take back all your cards. Loch Ness ends not after a fixed number of rounds but when Meepsie reaches 65 victory point. Yep, Meepsie gets points, in a way. Every time Big Meepsie moves around the loch, Little Meepsie, which was unfortunately missing in our second-hand game – moves the same amount around the score track. So if you all keep driving Meepsie forward, the game is much shorter. Loch Ness is a family game, that’s not even a point of debate. You can easily play with children who have the recommended eight years or more. But it’s not just a kid’s game, adults and gamers can still enjoy it. There is only a small amount of luck in Loch Ness with the photo cards, everything else is determined by the players, even if it’s not visible to everyone. The game plays quickly, rewards bluffing and guessing the other players. One thing to complain is that, with four or five players, the good spots to take photos from are usually occupied when you want them, so even guessing right doesn’t mean you get to snap a good photo. But the special actions at least give you ways around that problem. 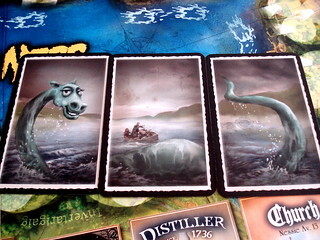 Loch Ness is a very good family game and at least a fun filler for adult gamers, it looks great and it has Meepsie. Let me repeat that once more: it has Meepsie. That’s all you need to know.